Snippets of Jack: "But You Have Heard of Me"
You know I'm beggining to think that Jack is not being treated the way he deserves. He save Elizabeth Swann in Pirates of the Caribbean: The Curse of the Black Pearl Jack saves the life of Elizabeth Swann by ripping of her corset. Let us see how he is repaid, shall we? Mullroy: "Never would've thought of that." Jack : "Clearly you've never been to Singapore. [sees medallion, to Elizabeth ] Where did you get that?" Norrington: "[to Jack , pointing his sword at him] On your feet." Governor Swann : "[helps Elizabeth up] Elizabeth . Are you alright?" Elizabeth : "Yes, I'm fine." Governor Swann : "[sees Murtogg holding Elizabeth's corset; Murtogg points at Jack ; Swann looks over at Jack ] Shoot him!" Elizabeth : "Father! Commodore, do you really intend to kill my rescuer?" Norrington: "I believe thanks are in order. [offers his hand to shake; reveals P for pirate] Had a brush with the East India Trading company, did we, pirate?" Governor Swann : "Hang him." Norrington: "Keep your guns on him, men. Gillette , fetch some irons. [sees tattoo of a sparrow in flight] Well, well. Jack Sparrow, isn't it? 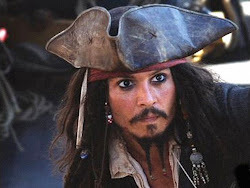 "Jack: "Captain Jack Sparrow, if you please, sir. "Norrington: "Well, I don't see your ship, Captain." Jack: "I'm in the market, as it were." 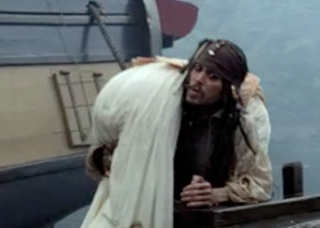 Norrington: "[Looking through Jack's things] No additional shot nor powder. A compass that doesn’t point North. [Then taking Jacks sword and looking at it]And I half expected it to be made of wood. You are without doubt the worst pirate I’ve ever heard of." And of course Jack comes up with a great come back. Jack: "But you have heard of me." Did you see that? They just arrested the man who had just rescued the Governor's daughter! Outrageuos! In fact, I think it was very good that Jack escaped because really what did he do wrong? Rescue the most important lady on Port Royal? Have a tattoo of the letter P? These things are certainly not evil. And you'd think that that was the worsed part, but no. They have to insult him as well, calling him names and teasing him about how his compass doesn't point North. Well who cares about North, the compass points to what you want most! I think that's a bit cooler then their compasses. He also talks about how pitiful it is that Jack only has one shot, but actually Jack has his reasons for not getting additional bullets. Not only does Norrington make fun of his compass, he also teases Jack about how he's not a captain because they don't see his ship.If only Jack hadn't been so modest, and told them about the Black Pearl they wouldn't have been such meanies. Of course, Jack always finds a way out of sticky situations like these, with the help of his dear friends Elizabeth and Will. It takes a pretty good pirate to top that!